Insta's New Model 256 Manual Swing-Away machine with 16”x20” platens swings almost a full 180˚ to the right - providing you with unobstructed access to the lower platen while you load your garments and place your transfers. The new Quick-Change® platens allow you to quickly swap your lower platen with any of Insta’s new accessory platens. The quick-change feature also allows you to quickly rotate the lower platen in a matter of seconds to suit your applications. Adjustable Opening - The Model 256 pressure adjustment system allows the operator to increase the space between the upper and lower platens, to reach a maximum opening of 2.75” wide, allowing application to items that are up to 1.375” thick. 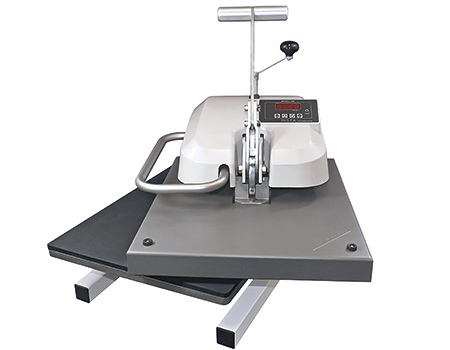 Fully Dressable - The Model 256’s new H-frame designs allows for dressing of garments onto the lower platen with complete clearance under the lower platen. The swing-away feature allows for unobstructed access to the platen while you work. Loading garments and placing transfers is hassle-free. Central Pressure Source - The strategically placed pressure source is centered over the upper platen and uses struts to drive pressure out to all corners. The result is an unparalleled even and heavy-duty distribution of pressure. Quick-Change® mechanism for new accessory platens. Pressure adjustment system for printing thicker substrates. Ergonomic wrap-around stainless steel handle. ETL & CE approved. RoHS/WEE compliant.